Physical Characteristics: Grow to 41 inches long and weigh 32lbs. ; average size is usually much less with variation across range. Fins have white leading edges, with head and mouth larger than most salmonids, hence its name. Coloring is pale yellow to crimson spots on a darker background; spawning adults develop varying amounts of red on belly. Unlike other members of salmonid family, they lack teeth on roof of mouths. Diet: Juveniles feed on plankton and other aquatic invertebrates. As they mature eat other fish, including eggs and fry, and species like whitefish and other trout. Habitat: Require very specific habitat components to spawn and survive. 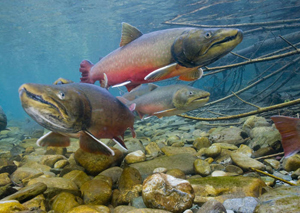 Water must generally be below 55 degrees F, have clean gravel beds, deep pools, complex cover such as snags, and expansive systems of interconnected waterways to facilitate spawning migrations. Favor deep pools of cold lakes/large rivers, as well as high mountain headwaters. Presence or absence of Bull trout is an excellent indicator of water quality. Range: Found in cold, clear waters of high mountains and coastal river (may be anadromous) of northwestern North America. Clearwater Basin provides many crucial and ideal waters, including headwaters of primary river drainages. Virtually all of Clearwater River System and tributaries offer good habitat, including adjacent St. Joe and Salmon River Systems. Strongholds are Upper North Fork Clearwater and Upper St. Joe Rivers, which are located in the Upper North Fork Roadless Area (which is proposed for Wilderness). Reproduction: After fourth year are ready to spawn in fall. Will return to birth river only if water temperatures are ideal – mid 40′s – with clean water/silt-free bottom. Any changes in habitat will prevent spawning. Unlike salmon they do not die after spawning and spawn multiple times during lifetime. Eggs require 4 – 5 months to incubate; hatch in late winter or early spring. Fry remain in natal streambed up to three weeks before emerging. Threats: Officially listed as “threatened” under Endangered Species Act, but menaces to recovery include habitat degradation/fragmentation, blockage of migratory corridors, poor water quality, climate change and past fisheries management practices, including introduction of non-native species such as brown, lake and brook trout. Mating with latter species produces sterile offspring. Logging roads are major habitat threat in Clearwater Basin; other habitat alterations from mining and off-road vehicle use may be significant in certain areas. Miscellaneous: May either be migratory or resident. Residents spend entire lives in same stream or creek and are generally smaller and grow up to 10 inches long. Migratory fish move to large water to over-winter and then migrate back to smaller waters to reproduce. Migratory fish grow larger, reaching 35 inches long and up to 32lbs. Learn more about efforts to recover bull trout.